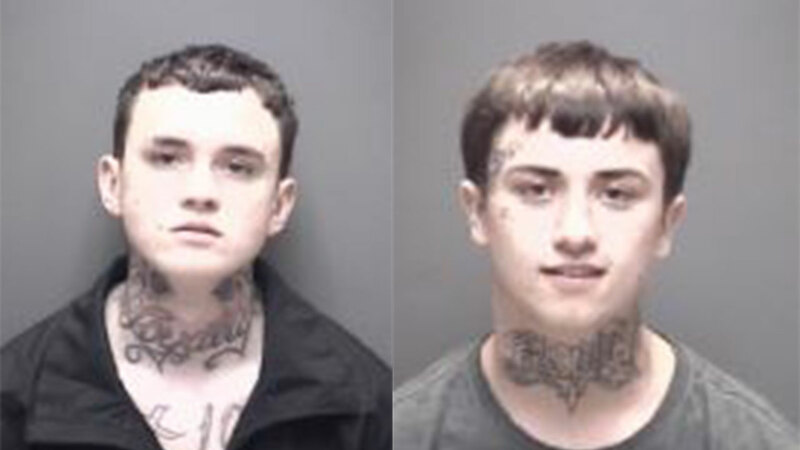 Cameron Tucker, 19, and Issac Brown, 17, were taken into custody Thursday evening after leading authorities on a chase through Texas City, League City, and Dickinson. Two teens accused of shooting an AK-47 at a La Marque home were captured after flipping their Pontiac during a high-speed posted to Snapchat. Both men were wanted in a drive-by shooting Sunday morning. Authorities say officers were working on a joint investigation on Thursday when the suspects were spotted in the white Pontiac in the 3200 block of I-45 in Texas City. When a sheriff's deputy turned on his lights and tried to stop the car, the driver, identified as Tucker, sped off. Authorities say at one point, Brown, who was the passenger, slid over behind the wheel while Tucker jumped in the backseat with a 17-year-old woman. The suspects led officers through Dickinson, parts of League City, San Leon and Bacliff, before heading back to Dickinson. At times, the chase reached speeds of up to 115 MPH. At one point, investigators said Tucker pulled out his phone and recorded the chase on Snapchat. The chase came to an end when Brown lost control of the vehicle and rolled into a ditch. After the accident, police say Brown exited the vehicle and took off running. Deputies took Tucker and the 17-year-old woman into custody for questioning. The woman was released later. Brown was arrested at around 5 p.m. after he was spotted at the 4900 block of FM 517, authorities say. Both Brown and Tucker are being questioned. Charges are pending.